You know the old saying, right? Something about April coming "in like a lion," going "out like a lamb," and "finishing with a .586 win percentage?" Anyway, it's in the old Farmer's Almanacs somewhere, right next to predictions about the next Tigers World Series Championships. The Tigers finished April 13-10, and not to immediately throw a wet blanket on the festivities, but that's the first time they've had a winning month since April of 2015. It's nice to be back on track. There are 138 games left in the season, and the Tigers will need to go 76-62 (win percentage of .551) to hit the 90-win mark. Let's break down the April results and hand out the grades! Just terrific. Fantastic group, actually. Not only did they have the minimum suggested amount of five starters, they even threw a sixth one in there in the form of Michael Fulmer. Just goes to show that the Tigers are very committed to the notion of having starting pitchers. Also, they are committed to the idea of "rotation." I looked at several different stats sites and reviewed dozens of hours of video, and not once did any Tigers starter pitch a game, and then try to come back the very next game and pitch again. They all took turns, so it was a very good job by the group, rotation-wise. All things considered, I'd say they deserve at least an "A" grade, if not an "A+" grade. They had starters, and those starters rotated. Stellar work! Justin Verlander has a 5.46 ERA and Mike Pelfrey has a 5.68 ERA, so LOL to ERA as a useful stat. JV and Anibal Sanchez are both striking out more than a batter per inning. That's good. They're also both giving up at least one HR per start. That's not good. Jordan Zimmermann still has an ERA under one, at 0.55, so ERA is back on the party invitation list. Mike Pelfrey is only throwing 57 percent of his pitches for strikes, and over the last five years he's been closer to 63 percent, so that's why you swear so much during his starts. Zimmermann leads the way with an average of 6 2/3 innings per start. You'd think Pelfrey would be at the bottom, but he's not. It's Sanchez, with an average of closer to 4 2/3 innings per start. Graded by runs-allowed-per-game, the Tigers have the fourth-worst starting rotation in the AL Central at 3 runs per game. Ah, now we get to the fun stuff. Batters, you see, are much easier to grade. Just look at the word "batters," and you'll immediately see "bat" in the first part of that word. All of the available evidence shows that every single Tigers batter has, in fact, gone to the plate holding a bat. Not a single one of them stepped into the box holding a hose, or a sub sandwich, or even a box of ferrets. That's a 100 percent success rate, so we'll give them an "A+" as well. The team walk rate is now 7 percent, so they're no longer fighting it out with the A's to see who's the worst walk-taking team in baseball. The A's and Royals are now having that battle. Jarrod Saltalamacchia got off to a roaring hot start in his first 12 games, but then cooled way down, going 1-for-17 (.059 batting average) in his last five games of the month, with a strikeout rate of 53 percent. Justin Upton did just the opposite, slashing .195/.221/.280 (and a 41 percent strikeout rate) in his first 20 games. In the final three games of the month, he slashed .385/.385/.615 with a home run and four RBI, only striking out in 23 percent of his plate appearances. 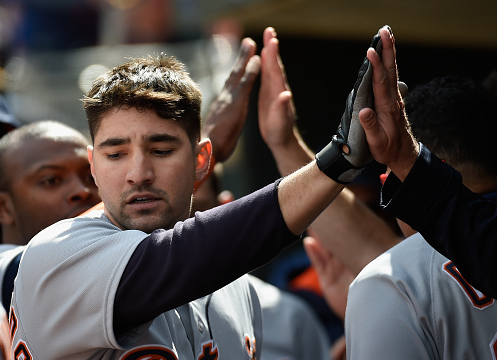 Nick Castellanos slashed .363/.376/.563 for the month with three dingers, five doubles, a triple, and 14 RBI. He's on pace to finish the season with 23 home runs. Your current American League batting champion? Nick Castellanos. Enjoy that while it lasts. Remember all those infuriating double plays from last year? The Tigers are on pace to finish the season with 101 GDPs, and you have to go back to the 2006 team and their 120 GDPs before you get anywhere close to that good of a result. Strangely, that image also conjures up memories of last year's bullpen, but for very different reasons. This year has been a very different story. The Wilson Brothers own the highest strikeout rates, Justin at 37 percent and Alex at 30 percent. The next highest reliever is Mark Lowe at 20 percent. Measuring by RE24 (expected runs prevented above average), Justin Wilson leads the group at 5.5, while Alex Wilson and Kyle Ryan are tied at 3.0 each. The bullpen and the offense are both performing at above-average levels, and that might just be enough to make up for a starting rotation that is treading water at best. The White Sox finished April with a 17-8 record, but the Royals finished the month at 12-11, just slightly worse than the Tigers own 13-10 start. The division is going to be tough, but if the Tigers can improve their starting pitching even a little bit, they're still very much in the running to take the AL Central crown in 2016.